A hardy colourful bromeliad with interesting markings - great as a feature on its own, in masses, or climbing a tree (place at the bottom of a tree and the pups will climb). 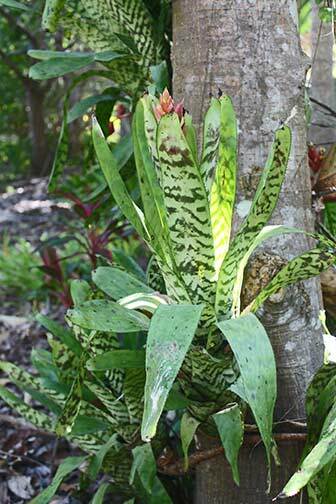 A fauna refuge: create a sanctuary for little frogs in the water-filled well of the Bromeliad. To use as a habitat for frogs, plant in a shady spot around a water feature and remember to keep the vessel of the plant topped up with water. Full sun to shade, tropical to temperate frost free areas. Prefers an Orchid potting mix or a porous mixture such as equal parts bark chips, humus, peat moss and sand. During the growing season it is advisable to keep water in the funnel at the centre of the rosette most of the time. Keep the soil barely moist - only water when the soil is dry to the touch. INDOOR PLANTS:Feed in spring/summer by spraying with a weak seaweed emulsion (half the strength recommended on the lable).